The clean sheets may have dried up but AFC Fylde boss Dave Challinor believes his AFC Fylde side have become more creative in attack in recent weeks as they bid to get the balance right at Dover Athletic on Saturday. Challinor’s miserly defence achieved 12 shut-outs in the first 18 games of the National League season but they haven’t managed one in their last five games, conceding a last-gasp equaliser in Saturday’s 2-2 home draw with Sutton United. The Fylde boss is aware the margins are very fine and said: “There is a fine line between attacking football and defensive responsibility. “We have been more creative in the last five games but haven’t kept a clea sheet and we have been punished. “You look back on the goals last Saturday and you have to say we’ve been unlucky. For both goals we’ve had bodies back but shots from outside the box have gone through 16 pairs of legs. He hopes that creativity will be further boosted by the addition of Arthur Gnahoua on loan from Shrewsbury. The attacker scored the winning goal on his Coasters bow at Hartlepool and made his full debut against Sutton last weekend. Challinor said: “Arthur did really well in his cameo at Hartlepool. He has played on the right but we didn’t get Nick (Haughton) and Rowey (Danny Rowe) into the game. Challinor wants to see the dangerous Haughton receive good service to help break his goalscoring duck. Challinor has plenty of options, and with Lewis Montrose coming back into contention and only Danny Kane and James Hardy unavailable due to injury, he says the club is in a good place. 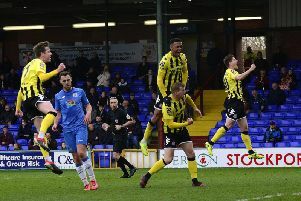 They have slipped to sixth spot but are only a point behind Harrogate Town in third and the manager added: “ The top two, Leyton Orient and Salford City, are looking really strong and the rest are much of a muchness. Second-bottom Dover were beaten 4-0 at Mill Farm in August but have taken seven points from their last three games. Challinor said: “They have had big changes in terms of their personnel and style of play. They have been more consistent since Andy Hassenthaler has taken over and it will be tough. The manager has not been distracted by speculation linking him with the manager’s jobs at Cambridge United and Wrexham. Asked if it was nice to be in demand, he replied: “I always say that if you and your players are being linked with other clubs it means you are all doing something right, and if you aren’t being talked about you are doing something wrong.